Clifford “T.I.” Harris totally took over Atlanta radio station Hot 107.9’s Birthday Bash 17 this year and on Saturday night (June 16, 2012) he brought out all of his friends! As the self-proclaimed “king of the south,” Tip brought out a slew of high-profile guests for the biggest night in southern hip-hop. 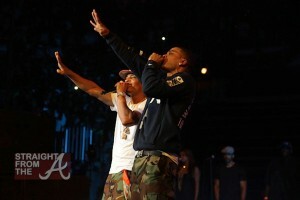 The annual concert, held at Atlanta’s Phillips Arena, featured a long list of acts including Rick Ross, Gucci Mane, Future, Travis Porter, Ca$h Out, and a surprising “A-Town Classic” set which featured hometown acts like Dem Franchize Boyz, Trillville, Crime Mob (yes Diamond & Princess reunited onstage), Lil’ Jon and Lil’ Scrappy. Despite the star studded line up, it was Tip who stole the stage as he surprised fans with appearances during his closing act by bringing out Lil’ Wayne, Usher, Kelly Rowland, Nelly, Young Jeezy, and Chief Keef. 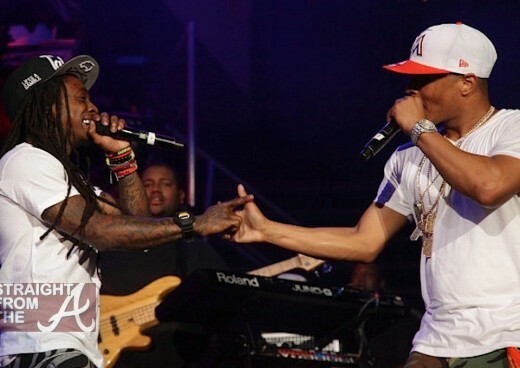 When Tip brought out Lil’ Wayne, he allowed the YMCMB bossman to take over for a moment as Wayne performed “Motivation” onstage with Kelly Rowland (LIVE for the first-time ever). This one will go down in the history books!